I spent my childhood and most of my life in picturesque Grave. Since 2010 I live in Cuijk but all of the region known as Land van Cuijk is dear to me. Ironically enough, in later years the teaching course ended up being incorporated into the Arts Academy! In my early professional years, I mainly created ink drawings, for example of old Grave. I later moved on to working with water colours and subsequently also with oil and acrylic paints. For a while I taught painting to adults but I had to give this up due to lack of time when I had to take up other part-time employment in order to be financially independent from constricting regulations. I needed any spare time in order to paint, pursuing my own art. In general my work is characterised, but not solely defined, by the use of warmer colours. I work in oils as well as acrylics and water colours. 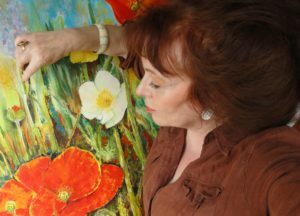 Initially I paint quite thickly often using a palette knife. Depending on the aim and subject matter I will accordingly make use of strong colours, shadows produced by the structure in paint or contrasts. My oil and acrylic paintings are best viewed from a short distance; they are usually larger than my water colours. I do not specifically aim to convey a message but I obviously feel delighted when people enjoy or are fascinated in some way by my paintings. I aim to create a balance between composition and colour. My mood obviously influences the creative process; music too can do this. My subjects are usually random; I may be inspired by natural lighting or a certain colour effect – even a photograph in a newspaper. Often, I feel inspired but the so-called free “pick flower meadows” we enjoy in our local countryside. Sometimes I get a bit greedy with all these flowers for the picking! (and not just me…). The landscape of my local river, the Meuse (known in Dutch as Maas) fascinates me. With its ever-changeable weather and seasons there is always something beautiful and interesting to discover. Around Oeffelt, Boxmeer and in the opposite direction towards Grave, Ravenstein and further on – it’s all rather charming. Obviously, there is plenty of inspiration to be had from other parts of the Netherlands too. I also accept commissions if I think I can fulfil and bring to fruition someone’s specific creative wish.